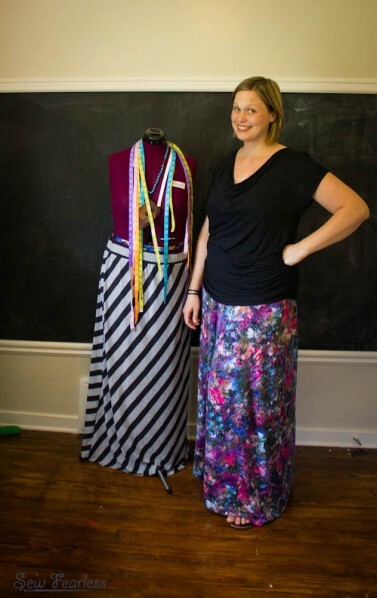 It’s been 3 months since I made my first of three self-drafted maxi skirts. 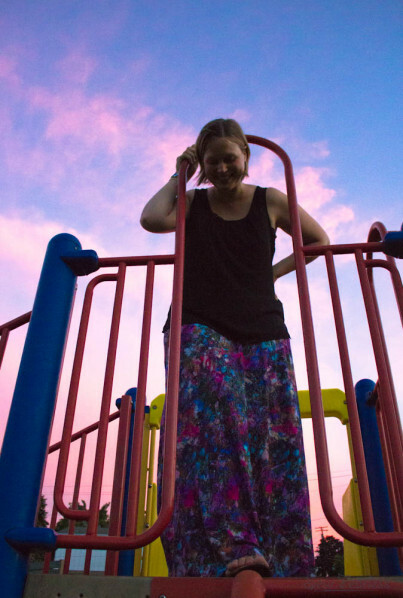 Nothing was fitting, it was getting hot, maxi skirts seemed like a good solution. I was surprised by just how easy it was to draft my own pattern based on my body measurements. For serious! It turns out drafting an a-line skirt is just about one of the easiest things ever. To make my pattern, I mashed up various online tutorials and used the Ask The Geniuses On Twitter method. (The most informative online tutorial I found then was Mad Mim’s.) I used the pattern to make the crazy orange skirt above. Since then, Andrea has posted a wonderfully simple and straight-forward method on her blog, The Train To Crazy. I am 5’10” and wear 18-20 in ready-to-wear. 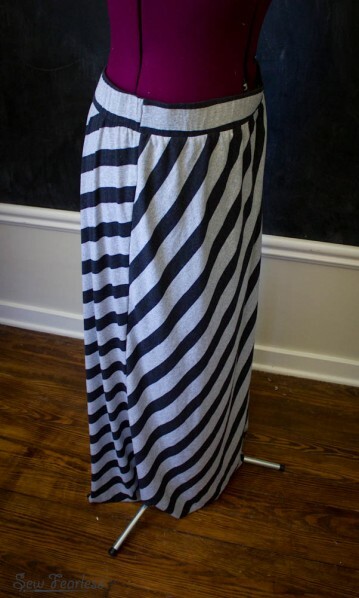 With the success of the first skirt, I tried it again to make a second with some “stash” striped knit. I had trouble fitting the two pieces out of the yardage, and I messed up the angles of the stripes on the front and back. It looks all sorts of funky on the sides, and the encased elastic waistband is gross. I have never worn it. yeah… ugh. skim this photo real quick and move on. For try #3, I found some rayon spandex jersey. My original skirt pattern didn’t have a lot of volume it. For this version, I increased the bottom hem quite a bit. The front and back pieces where identical on my first two skirts. 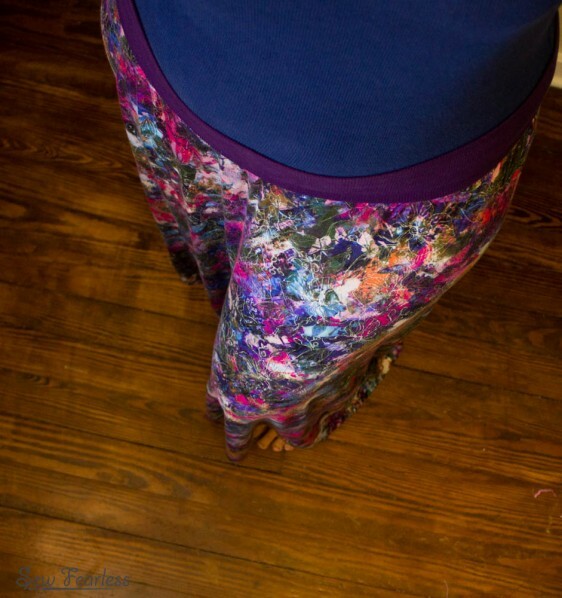 For this purple skirt, I scooped the front waist down 3 inches. That way the waistband can sit below my pooch without the front hem dragging. 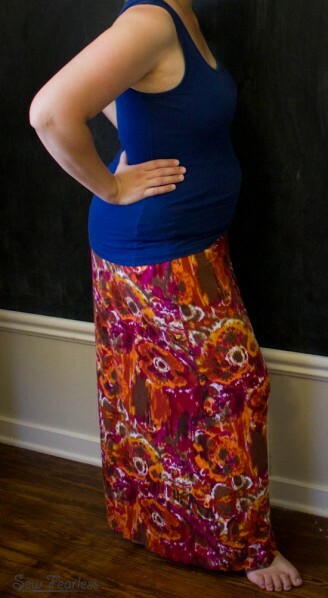 (Again, see my maternity skirt post for more details.) Yes, after 5 babies maternity style waistbands really do work best for me. 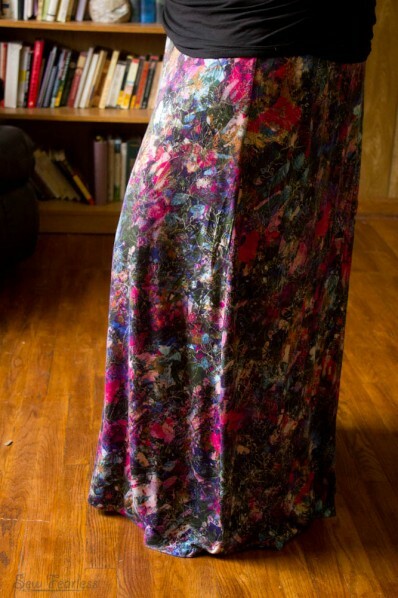 The trickiest part of this whole project was trying to get a photo of myself wearing the skirts that I didn’t loath. After multiple attempts at it, I now have hundreds of awkward photos of myself. oh joy. Knits aren’t that scary! Just make sure you are using the right needle (ballpoint for cotton jersey, “stretch” for super stretchy synthetics) and sewing with a “stretch” (zig-zag) stitch to prevent thread breakage. Many tips to had over at Made By Rae and Prudent Baby. If you have trouble pinning your fabrics, use some Wonder Tap. I will never hem my knits again without it. I discovered I like crazy busy prints best because they hid.. ummm.. figure flaws. At least that is what I am going with and no one has burst my bubble yet. 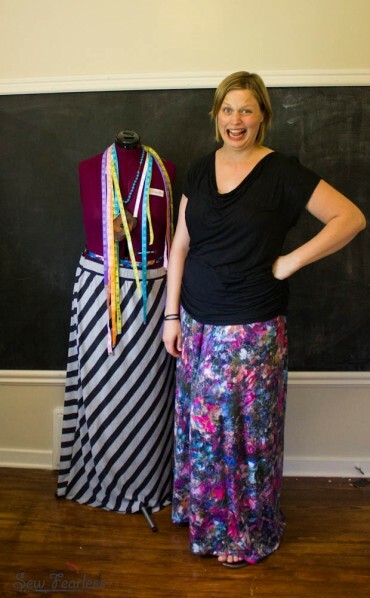 Have you ever drafted your own skirt pattern? How did it work out for you? LOVE! So cute! Where do you find those adorable prints?